A koyaku actor named Ichikawa Saruzô was recorded in the 1832 Kamigata hyôbanki. He was not considered as an official holder of the name. No record afterwards. A katakiyaku actor named Ichikawa Saruzô was recorded in the 1837 Edo hyôbanki. He was not considered as an official holder of the name. No record afterwards. Born in 1835. Fourth son of Ichikawa Ebizô V. He received the name of Ichikawa Saruzô I in the 11th lunar month of 1838 when he made his debut as a koyaku. His father Ichikawa Ebizô V was arrested and accused of violating the sumptuary laws in 1842. He was banished from Edo and settled in Ôsaka with his son. Saruzô had the opportunity to perform important roles during his stay in Kamigata. For example, he played the role of Oginoya Yaegiri in the drama "Yaegiri Kuruwa Banashi" in the 5th lunar month of 1848 at the Kado no Shibai. He went back to Edo with his father in the 2nd lunar month of 1850. He played in the 9th lunar month of 1852 at the Kawarasakiza the role of Minamoto no Yoshitsune in the dance-drama "Kanjinchô", sharing the stage with his father Ichikawa Ebizô V and his elder brother Ichikawa Danjûrô VIII in the roles of Musashibô Benkei and Togashi Saemon. He died in Edo the 29th day of the 9th lunar month of 1855 . 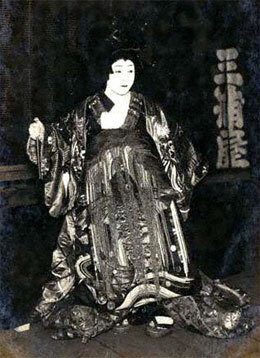 The actor Ichikawa Ebizô VIII held the name of Ichikawa Saruzô II from the 1st lunar month of 1870 to May 1882. Born in Ôsaka in 1867. His mother was the daughter of the Ichikawa Ebizô V's tokoyama in Ôsaka. He started his career in 1872 in Ôsaka as a disciple of Ichikawa Saruzô II and his first stage name was Ichikawa Kunimatsu I. He performed under the name of Ichikawa Juzô II from February 1884 to April 1885, then he took back the name of Ichikawa Kunimatsu I in May 1885. He settled in Tôkyô in 1886. He finally took the name of Ichikawa Saruzô III in November 1886. He performed in koshibai in his latter years, at the Kotobukiza and the Ryûseiza. He died the 15th of April 1906. He was the father of Ichikawa Saruzô IV and the master of Ichikawa Ennojô III. Born in 1900. Son of Ichikawa Saruzô III, his first stage name was Ichikawa Kunimatsu II and he made his debut on stage in March 1903 at the Kabukiza. He took the name of Ichikawa Saruzô IV in June 1920 at the Imperial Theater. He died the 4th of April 1942. 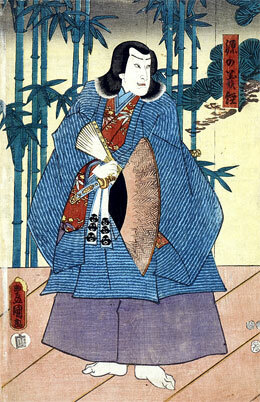 Ichikawa Enzô, not Saruzô, in Nojima Jusaburô's book "Kabuki Jinmei Jiten". The 29th day of the 9th lunar month of the 2nd year of the Ansei era was the 8th of November 1855 in the western calendar. 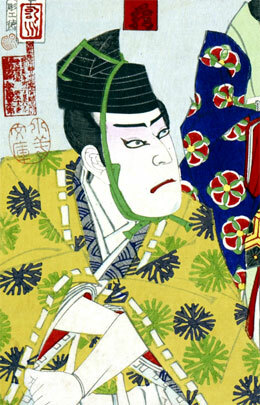 Recorded as Ichikawa Enzô II, not Ichikawa Saruzô III, in Nojima Jusaburô's book "Kabuki Jinmei Jiten". Was Ichikawa Saruzô III the adopted son of Ichikawa Ebizô VIII? Ichikawa Saruzô III's honmyô was Horikoshi, which was the family name of Ichikawa Ebizô VIII. Ichikawa Saruzô IV was not recorded in Nojima Jusaburô's book "Kabuki Jinmei Jiten".